It’s much less common in places where it’s colder and drier. (3) Tinea versicolor usually doesn’t cause any serious symptoms or problems. However, like other chronic skin conditions, it can cause embarrassment and self-consciousness because it affects your appearance. The good news is, there are treatments available. If you treat it early, and stay on top of it, it’s usually easy to control. Before you know it, you’ll be confident baring your skin at the beach again. The main symptom of tinea versicolor is the presence of uneven colored spots on your skin. They can appear anywhere on your body, but most people notice them on their face, chest, back, or arms. These are the areas on your body with more sebaceous, or oil glands, and conditions there are more favorable to support the growth of bacteria and yeast. As the name of this condition suggests, the spots are usually varied in color. They can be lighter or darker in color than your healthy skin. They can also range in color from red to salmon to pink, or tan to brown. Often, there are patches of scaly, flakey areas too. Tinea versicolor doesn’t cause any pain or other symptoms, but it may itch. Because it’s caused by a fungus or yeast which loves to grow in warm, moist conditions, tinea versicolor can flare up when the weather is warmer or more humid. Symptoms often improve when it’s colder and drier outside. If you live in a more tropical climate, you may have the condition year-round. Another interesting fact – the yeast responsible for tinea versicolor prevents the skin from tanning, (1) so you may have it year-round, but it becomes more noticeable in the summer. You can blame it on a microscopic yeast called Malassezia. It’s a common organism that lives on everyone’s skin. Most of us don’t even know it’s around. However, in some people, and under the right conditions, Malassezia can grow out of control and trigger chronic skin problems. Malassezia is the same yeast that researchers believe is behind the skin condition, seborrheic dermatitis. Teens are more likely to have it than older adults because their oil glands are more active, and hospitable to Malassezia. 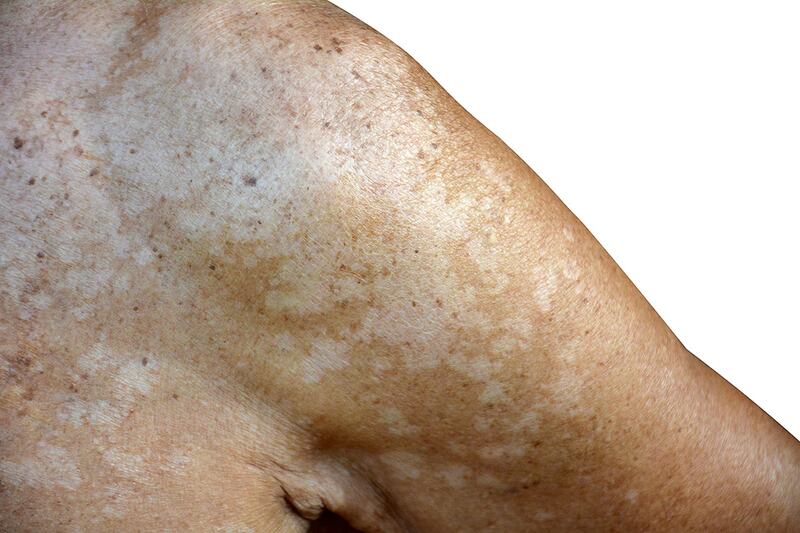 People who are malnourished are also more likely to develop tinea versicolor. Those with chronic health conditions that prevent them from eating enough, or getting the right mix of nutrients are especially at risk. It’s important to note that malnourishment doesn’t just mean not enough food. It can also mean not enough of the right foods – or a poor diet too! Under the right circumstances, the Malassezia yeast that lives on the surface of your skin morphs from a quiet occupant that minds its own business, to a pathogen that invades your space. It literally gets under your skin and triggers an inflammatory response that causes the color changes associated with tinea versicolor. It’s important to know that Malassezia thrives in warm, moist environments, and it loves oily skin. So, keep your cool by wearing loose fitting clothes and showering after a workout. In addition, avoid oils or greasy lotions on your skin. These simple steps can go a long way toward taming the yeast. Skin conditions can be tricky if you don’t know what you’re dealing with. So many of them have similar symptoms, and many chronic skin conditions (like seborrheic dermatitis, eczema, psoriasis, and acne) overlap, so it’s common to have more than one at a time. Therefore, it’s important to get an accurate diagnosis from a dermatologist, because treatments can vary. In most cases, your doctor will be able to diagnose tinea versicolor with a skin exam. If there’s any question, he or she may examine your skin under a special light. Treatments for tinea versicolor can vary depending on how much of your body is affected, how thick the spots are, and the climate you live in. Tea tree oil is an option for a natural antifungal treatment. Applied topically, it may be effective in controlling the yeast. These medications can have side effects, so it’s essential to take them properly and under a doctor’s supervision. Those who live in tropical climates and have recurrent tinea versicolor are usually candidates for oral medications. If it tends to come back each year with the warmer weather, you can also use the topical treatments monthly or as directed by your doctor. Treatments to control the yeast usually work quickly, but it can take several months for your skin color to even out. Be patient, and take steps to protect your skin from the sun, especially during this time. 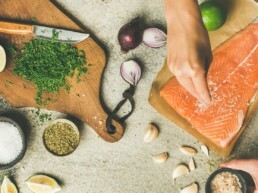 In addition to these conventional medical treatments, it’s important to do all you can in terms of improving your diet and lifestyle to support a healthy immune system. An integrative approach would include addressing potential underlying gut microbiome imbalances that could be impacting your skin. Getting the appropriate gut testing allows an integrative nutritionist or practitioner to help you identify what needs to be addressed. These steps can help to control the condition and hopefully minimize any recurrence. Minimizing stress and getting a good 8 hours of sleep each night can go a long way toward strengthening your immune system and keeping yeasts, bacteria and other pathogens in check. Dietary modifications are also very effective in boosting your immune system and calming inflammation. There is no one-size-fits-all diet, so it’s important to work with a nutritionist to identify any areas you where need extra support with foods or supplements. Eating a variety of colorful fruits and vegetables, and getting enough healthy fat from fish, nuts, seeds, avocados and olive oil is beneficial for your immune system and your skin. These foods are also the basis of an anti-inflammatory diet. Supporting healthy gut function is also an essential part of complementary treatment for most chronic skin conditions. Much of your immune system is controlled by the healthy bacteria in your gut, so eliminating offending foods, and eating more prebiotic and probiotic-rich foods keeps those bacteria healthy, happy, and working harder for you. Tinea versicolor isn’t necessarily a harmful skin condition, but it can be troubling to live with, and it can impact your quality of life. Being open to other approaches to that ensure your skin is getting the nutrients it needs while balancing the skin and gut microbiomes is key. Working with an integrative team or diving into gut function with a trained nutritionist can help you identify your next steps. 2) Gupta AK, Lane D, Paquet M. Systematic review of systemic treatments for tinea versicolor and evidence-based dosing regimen recommendations. Journal of cutaneous medicine and surgery. 2014 Mar;18(2):79-90. 3) Karray M, McKinney W P. Tinea Versicolor. Updated September 8, 2018. StatPearls (Internet) https://www.ncbi.nlm.nih.gov/books/NBK482500/. Accessed November 12, 2018. 4) Mendez-Tovar LJ. Pathogenesis of dermatophytosis and tinea versicolor. Clinics in dermatology. 2010 Mar 1;28(2):185-9. 6) Fratini F, Cilia G, Turchi B, Felicioli A. Beeswax: a minireview of its antimicrobial activity and its application in medicine. Asian Pacific Journal of Tropical Medicine. 2016 Sep 1;9(9):839-43. Need Help with Tinea Versicolor?Schedule a Private Skin Rebuilding Session!